Gather border and backing requirements and take advantage of our great selection on clearance. We are busy updating our website adding new items daily, check back often! 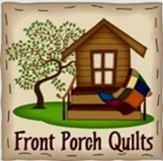 Fabrics by the yard, precuts, book and patterns, kits and sale items! Keep in touch on what's new and upcoming.